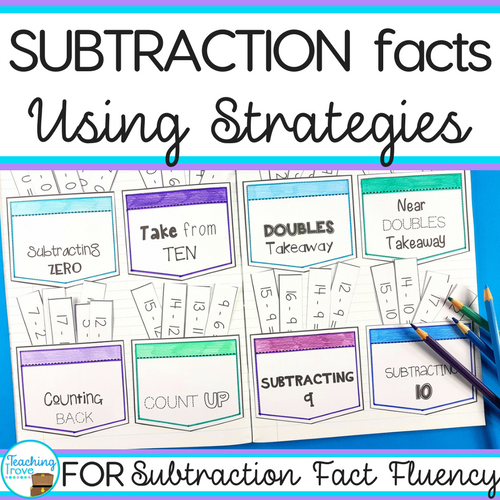 Number fact fluency is important to develop in first and second grade. Without automatic recall it’s hard to move on to more complex skills. 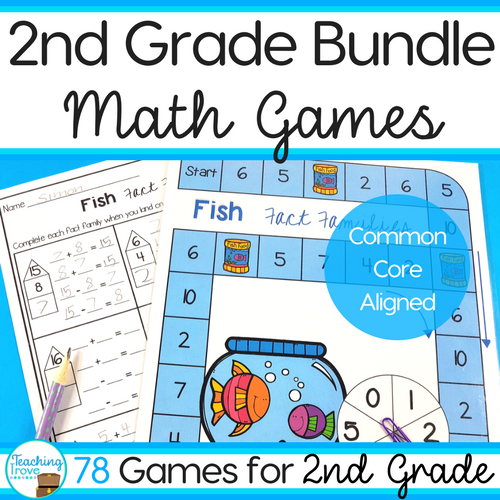 It’s also crucial in developing a child’s confidence in using mathematics. 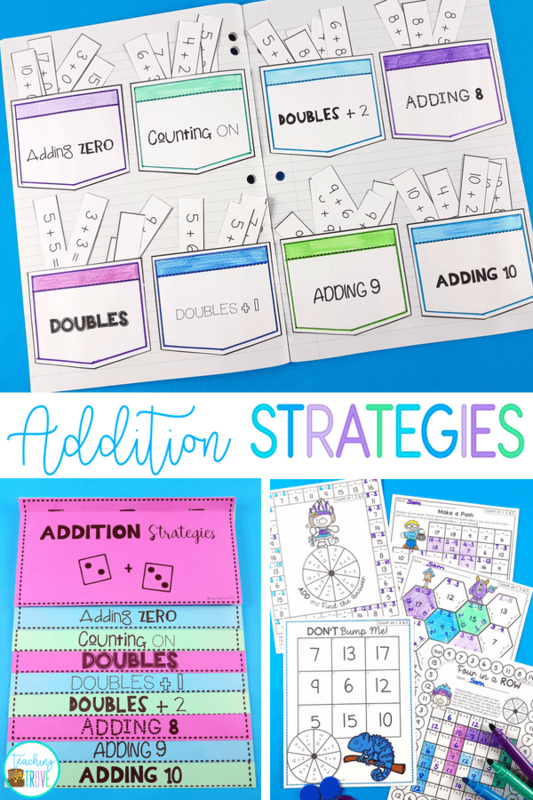 Without a doubt, kids need to know their addition strategies! It’s important to teach children addition strategies if we want confident young mathematicians. When a child can perform mathematical computations quickly and accurately they see themselves as being ‘good at math’. When a child uses less effective strategies to reach the answer or doesn’t reach the answer at all, they start to give up on math. We’ve all heard that groan from some students when it’s time to start math work. You can bet it’s not coming from the children who know how to apply the strategies! 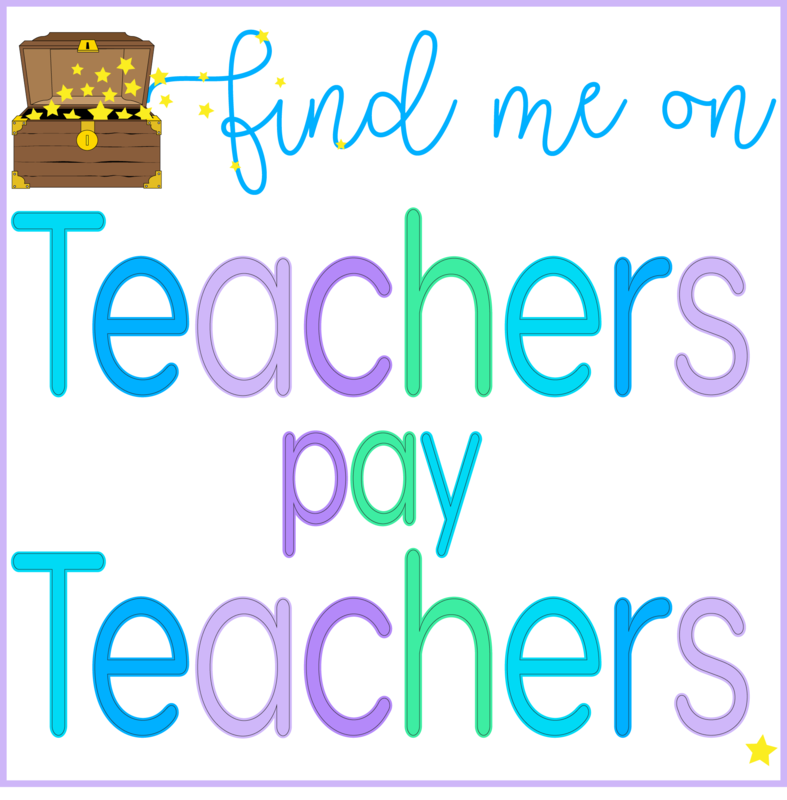 So what strategies should we teach? 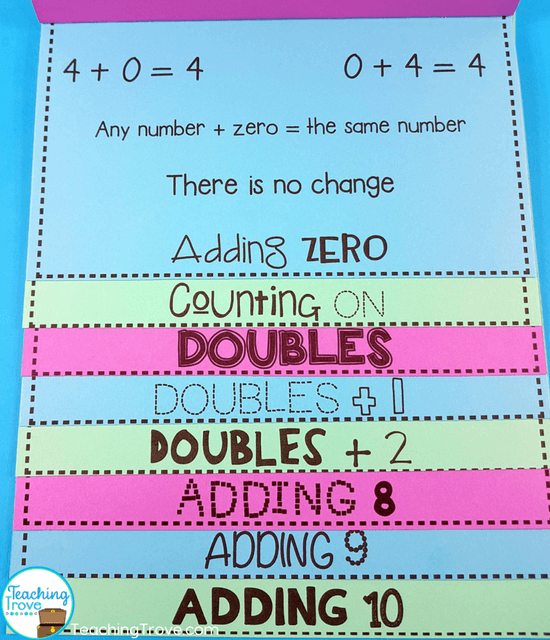 Children need to understand that when zero is added to a number, the number remains the same. I introduce counting on one first then counting on two and finally counting on three. 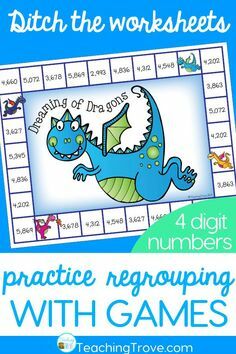 When kids understand how to count on each number I introduce counting on one, two and three combined. To count on, have your kids start with the largest number from the equation and then count on 1, 2 or 3. It’s really important to emphasize that they need to start counting on from the largest number. I always say, “Put the largest number in your head and count up.” It helps stop them from including the largest number when counting. If you say put 6 in your head and count the next two numbers they get the right answer. 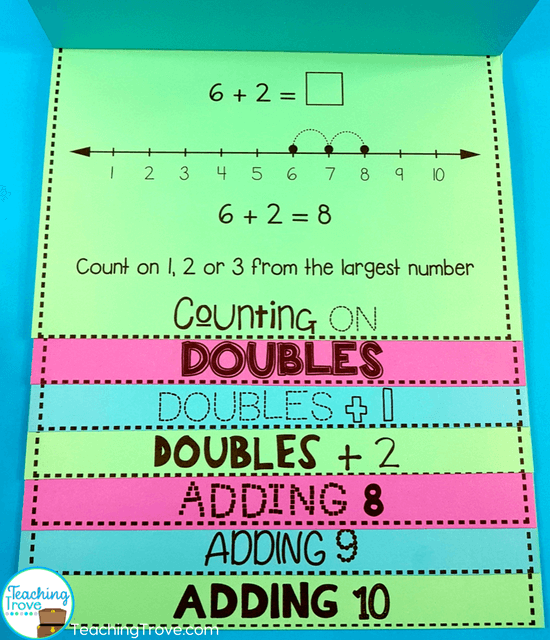 It’s also important that a child understands the commutative property when learning count ons. If they don’t, you’ll find that they count on from the first number in the equation regardless of whether it’s the largest. This won’t lead to fact fluency. This is simply doubling a number – 1 + 1, 2 + 2, 3 + 3, etc. In the classroom, pictures are often used as a memory trigger. Once the doubles are known it’s time to progress onto doubles plus one more. 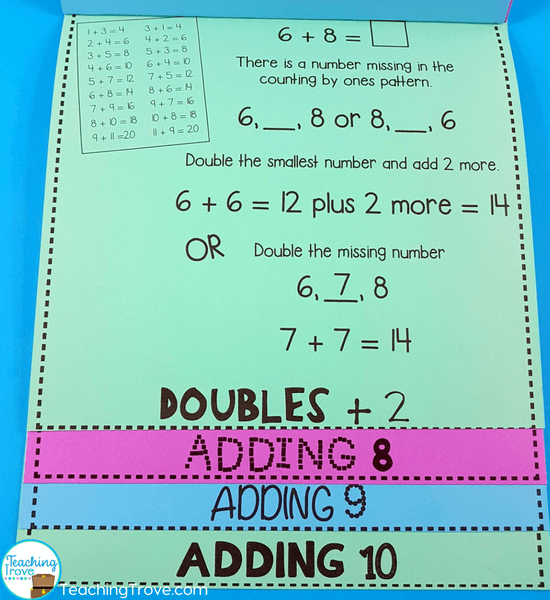 Doubles + 1 are easily identified because the numbers to be added (addends) lie side by side on the number line – 8 + 9 ( 8, 9 ). 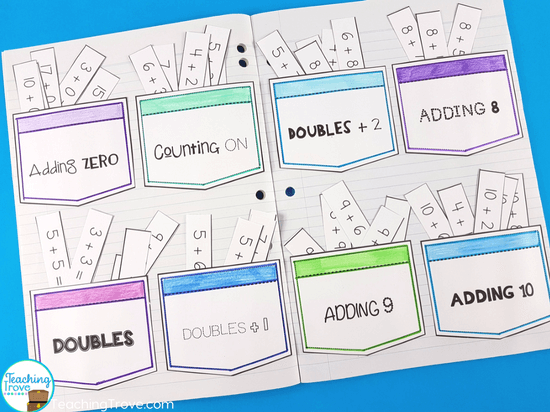 Once children have become familiar with their teen numbers, adding ten becomes easy. Children become aware that 17 = 1 ten and 7 ones, therefore 10 + 7 = 17. 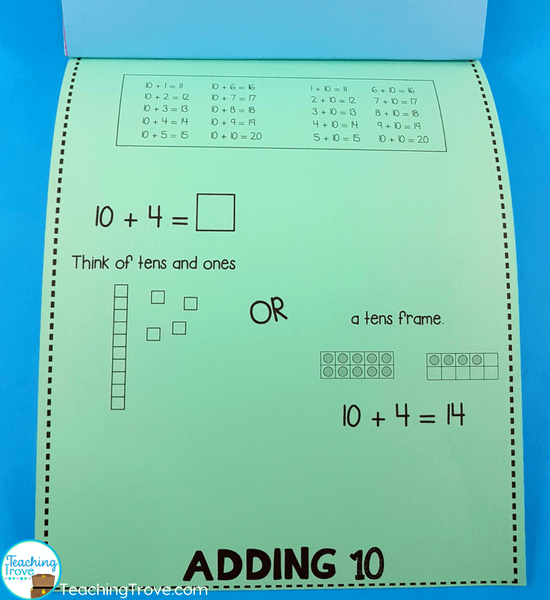 Using a tens frame is another option. 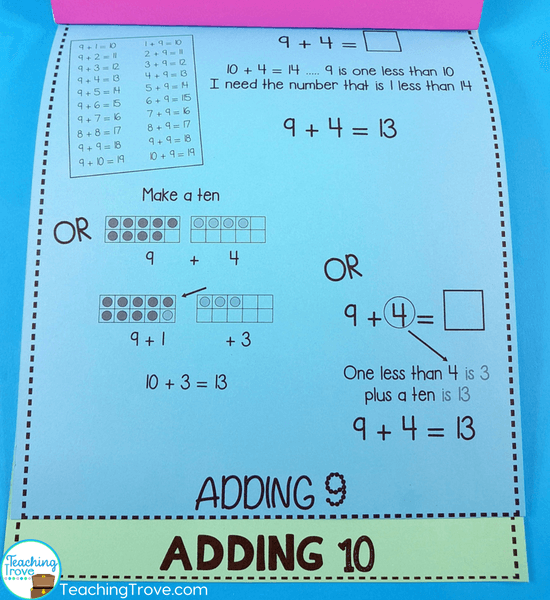 There are three addition strategies which children can use to help with adding nine. 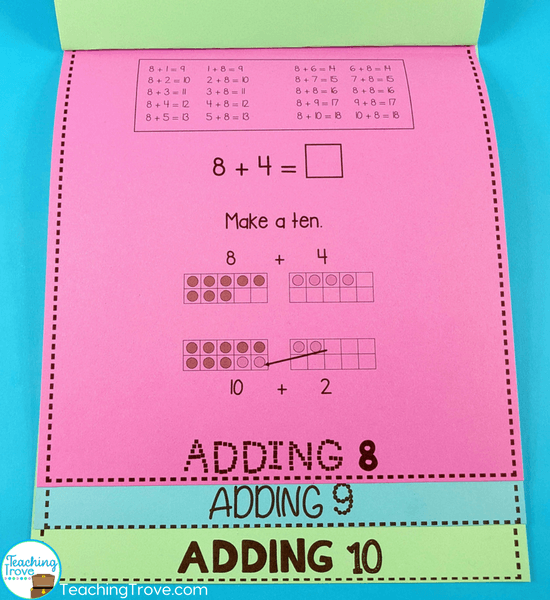 If children have a solid understanding of the addition strategies you may find that some children are able to use a ten to solve 8 + 4 and 8 + 5. Many of the facts have more than one strategy. 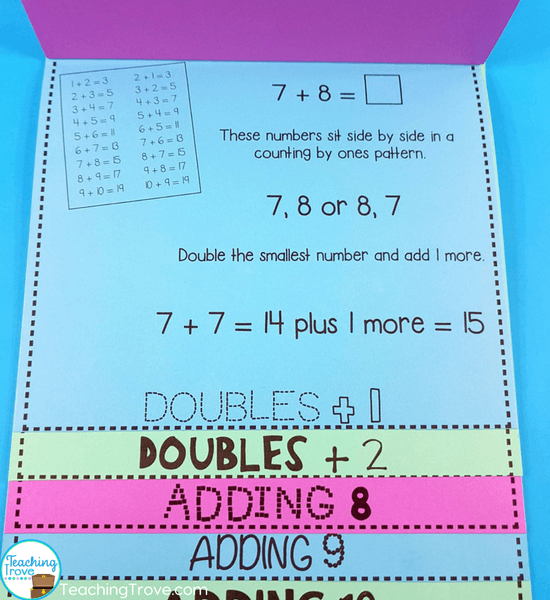 For example, 9 + 3 is both a count on and an adding 9 fact. 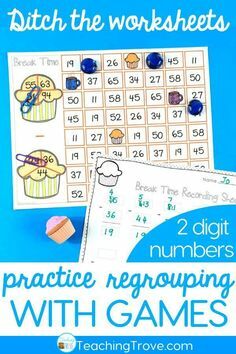 As counting on is an easier strategy, this is the one that children should choose. 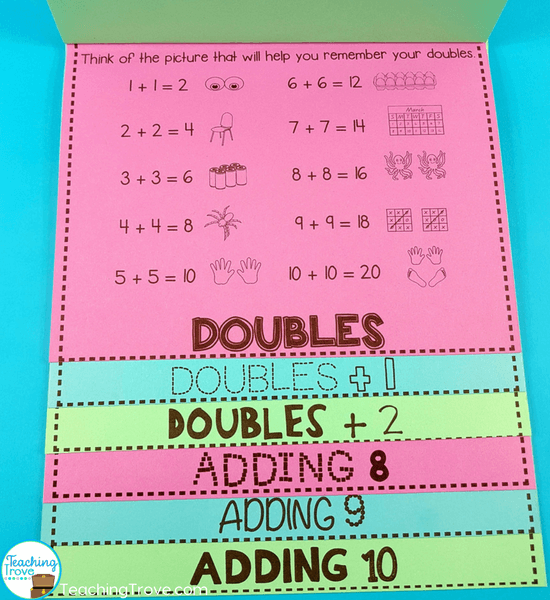 You can encourage kids to count on, use a ten or maybe this is the fact that they will memorize. 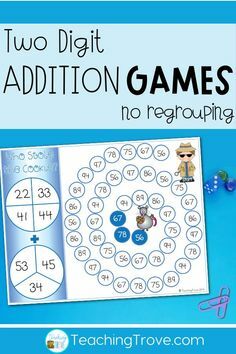 Each time you teach an addition strategy you want to reinforce it with games and activities. I love setting up math rotations with group, partner, and individual activities. 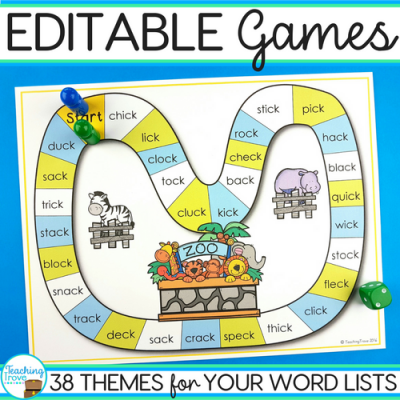 If your kids know their thinking strategies it will be easy for them to answer! 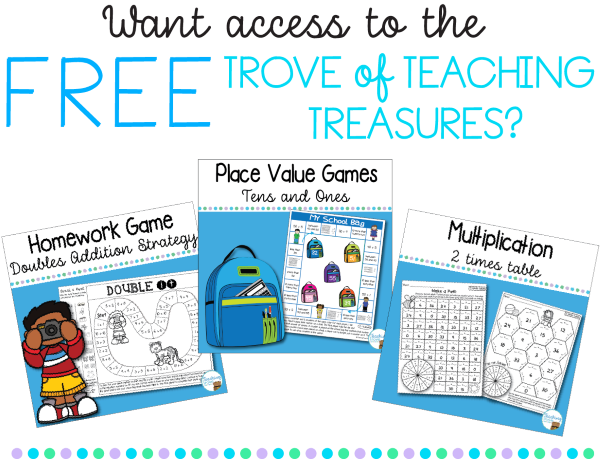 Grab the free count on games pictured below. Just click the purple button! 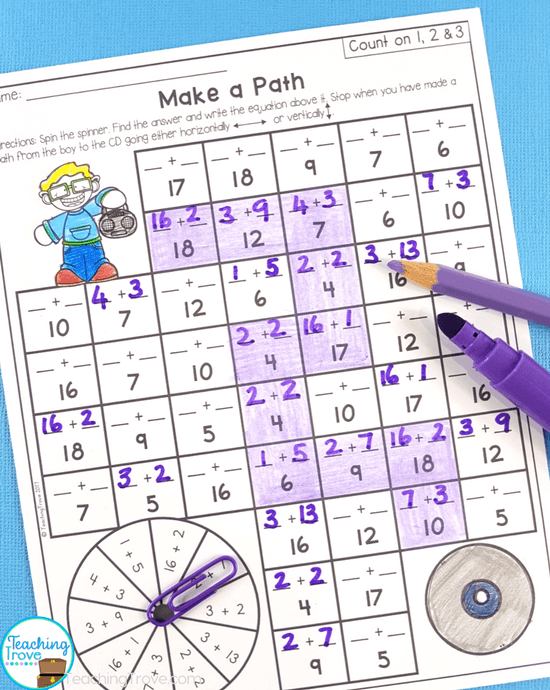 Make a Path is great to play independently. I love Find the Answer. It’s the game I always take with me when I’m tutoring! It can be played independently or with a partner. 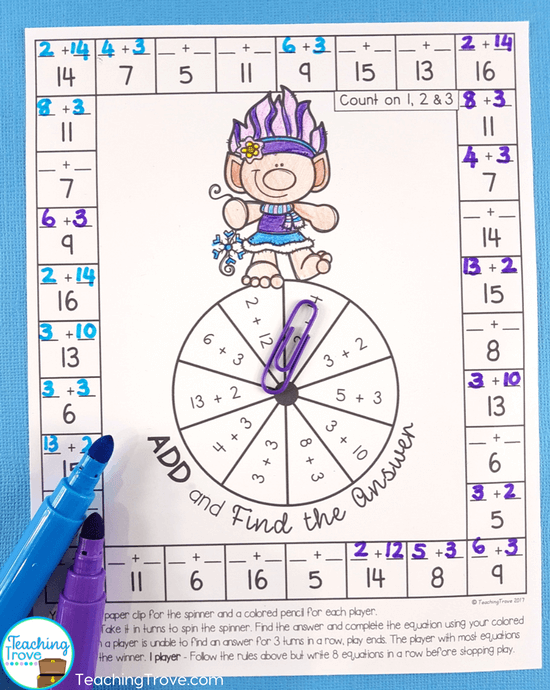 Spin and Find the Answer is a great partner game. But it can also be played by a single player. 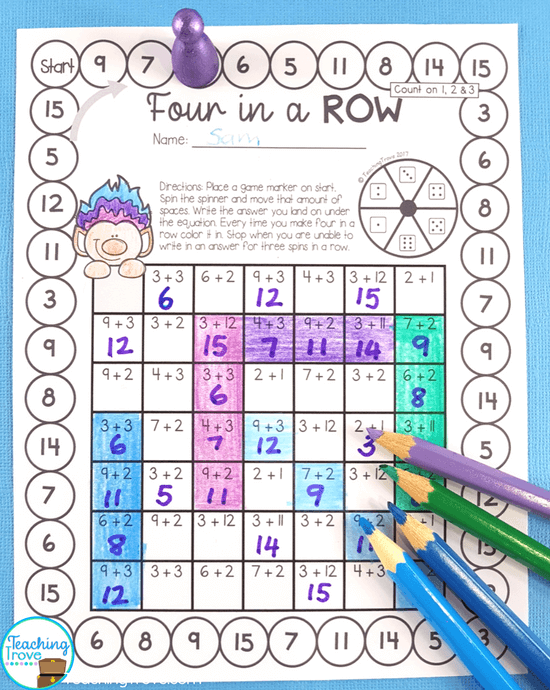 Four in a Row is a popular game and this one has kids writing in the answer. It can also be used independently. 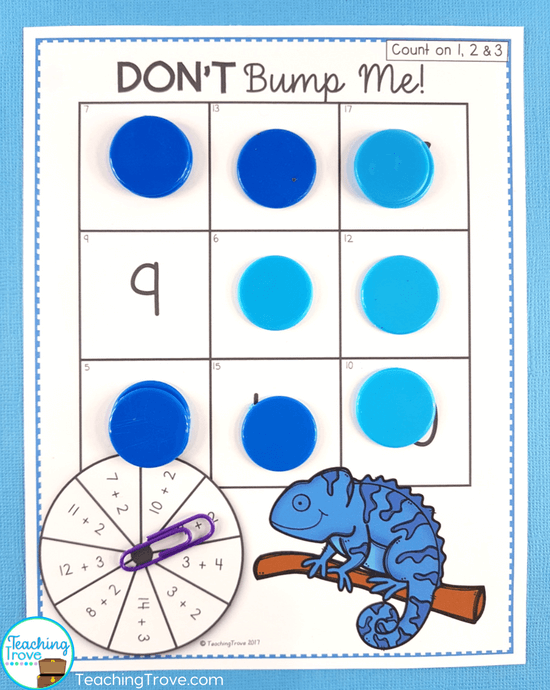 Don’t Bump Me combines the classic games – bump and noughts and crosses (tic-tac-toe). 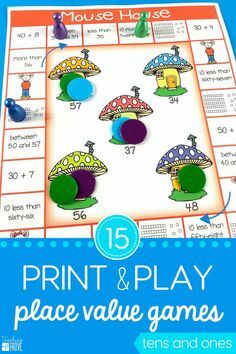 It’s definitely a partner game and heaps of fun! 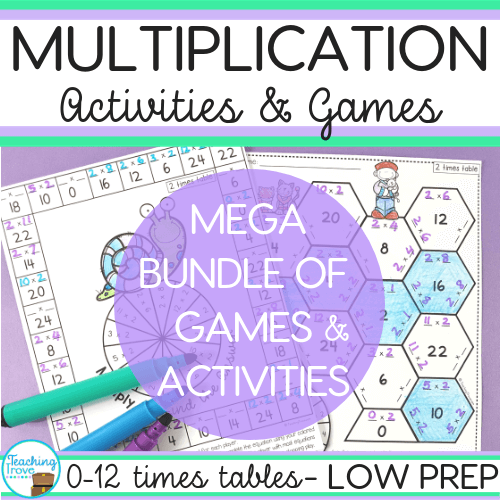 My addition pack contains all the above activities for each of the addition strategies mentioned. 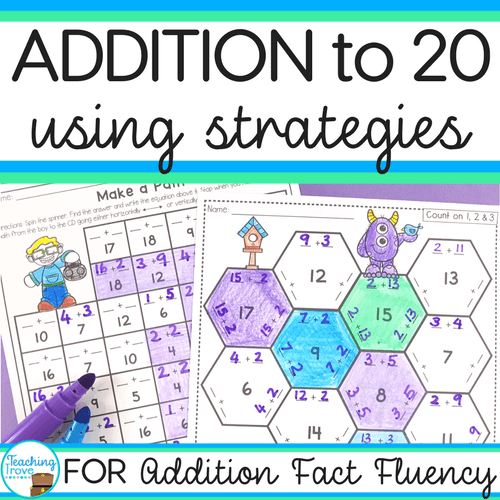 Grab a pack of addition strategy activities from my Teachers Pay Teachers store and start improving your kid’s addition fact fluency.